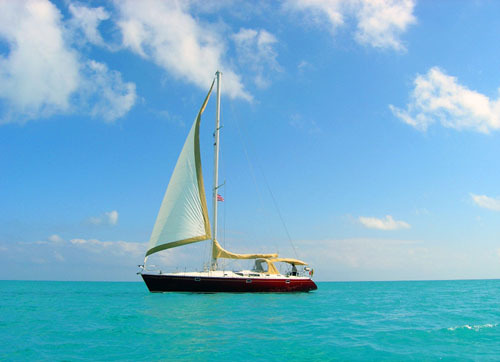 Sailing Yacht Zephyrus offering FL Keys - Bahamas Charter Specials! FL KEYS - BAHAMAS SPECIAL $6,000, 7 night minimum! ZEPHYRUS is offering up to 6 pax charters booked before Dec 14, 2013 and taking place before Mar 31, 2014 in either Florida or the Bahamas for $6,000. Full-board rate is PLUS bar and applicable sales tax and cruising permits. Zephyrus is a beautiful Oceanis 50' which was totally refit in 2011. She offers 3 guest cabins each with a queen berth and its on ensuite head and shower. The yacht is fully air-conditioned for your comfort. Her main salon comfortably accommodates 8 adults for meals and lounging and is equipped with a TV, DVD, stereo and an iPod dock. Her cockpit will set and dine 8 as well. She is equipped with a 12' tender and is available for charter in the Florida Key's and the Bahama Islands. 3 Queen cabins each with private head and shower. Yacht is fully air-conditioned, main salon with dining for 8 and TV/DVD/VCR, playstation 3 and stereo system iPod dock, ice maker, hot and cold deck shower.